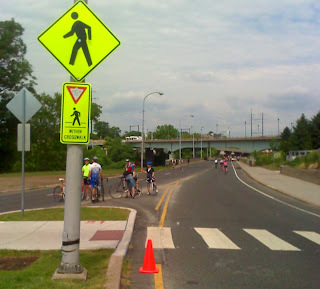 Today the Streets Department put up "Yield to Pedestrians Within Crosswalk" signs at MLK Drive. Two on the inbound side and one on the outbound side. They promise to install a second outbound sign in the near future. This is just a first step toward a safer MLK Dr and there is much more to be done. 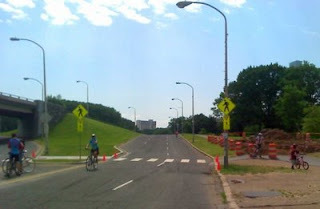 In the past few days the Bicycle Coalition launched its Take Back the Drive Campaign. In addition the Mayor's Bicycle Ambassadors will be at the crosswalk location every Thursday afternoon in the month of June. Ok guys, I'd like to support you even more than I already do, but your t-shirt (and frankly, all the rest of the items for sale) is AWFUL. How about a hip t-shirt, with, you know, color and design? Maybe ReLoad Bags would make a design for you as a tax deduction for their business. Maybe you could find some young, hip person who could design it for you. Until then, unfortunately, I just can't put another ugly t-shirt in my dresser.